Filipino painter Nelson Castillo’s “Metamorphosis” is an outstanding example of art shape-shifting. While art dares the observers to discern meaning and discover value; they aim to create imagery that entices a retort and inquisitiveness, and if done well, art provokes thought. Because of this imprecise and comprehensive nature, art spans an implausible gamut of ideas and themes, restricted only by each individual artist’s ability to convey their meaning. Even more, the meaning is something different in the eye of each beholder and that resourcefulness is the beauty of art. Who is better to portray that than an artist, Nelson Castillo, who is enamored with visual illusions and tricks – making one thing seem like several from two different angles. Nelson Castillo’s objective is the transformation of one item into a similar shape that symbolizes something else. 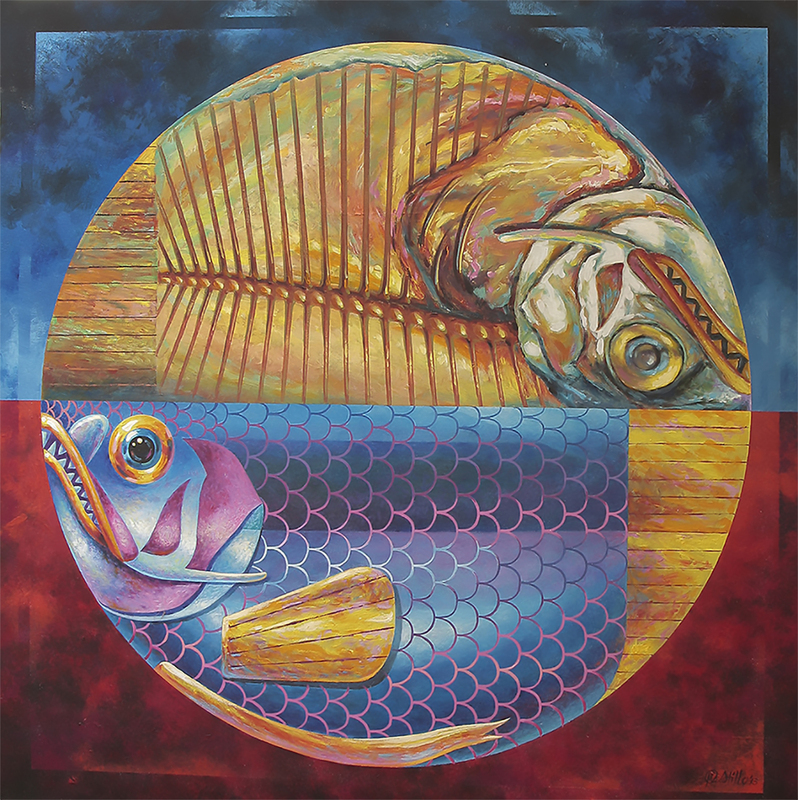 Castillo’s vivid metamorphosis of fish exhibits a biological external process that occurs as a result of synchronized changes in gene manifestation within an organism. Because embryonic development and change appears to be the rule in all fish species which involves a conspicuous and relatively abrupt change in the animal’s body structure through cell growth and differentiation. Nelson Castillo has taken perceptive illusions into the third dimension. The artist was fascinated by the double images of synchronicity of transformation, which are clearly reflected in this piece. The conceptual artist has been blurring the line between illusion and reality. The piece clearly shows the shifting from one form into another as they move or the viewers move around them; sometimes abstract realism metamorphosis forms are the intermediates while others are recognizable all along. Nelson Castillo vibrant artwork reflects the playful nature of his curiosity with creating diversity in his illusion art with visual deceit. His surrealistic metamorphic style is to superimpose two combining figures to create a larger image. The realism in this painting is what makes it so captivating, as you can often miss either the bigger picture or the smaller details. His artworks unfold more the longer you stare at them – what looks like a portrait of two mirror images of fish, within minutes, reveal itself to be a biological renewal of body forms. Nelson Castillo is an internationally acclaimed Filipino-American artist who was born in Alaminos Laguna on April 11, 1944. In 1964, Castillo received his Bachelor of Fine Arts degree from the University of Santo Tomas in Manila. He began painting miniatures in 1968 and was noted as the “Father of Miniature Painting” in the Philippines in 1979. He is also the father of “Janddie Castillo,” the “Wisik Artist” who is also known for his symphony of splashes, splatters and swiping strokes as well as his miniature stone art. The artworks showcased in this site are part of our personal art collection by art collector, Jason V. Macuha. Macuha Art Gallery supports the Philippine contemporary arts and the Filipino Artist. Through its spaces, exhibitions and gallery, aims to promote the Philippine contemporary arts by showcasing the art works of notable and emerging Filipino Artists. Scrapebox, or the internet entrepreneurs Swiss-Knife, can be a versatile and multi-functional “harvester”. articles because your content starts with articles and they can be posted on blogs, social sites, and article directories. This is where outsourcing can play a big role as well. There are many services and writers you can discover through web searches who offer ghost writing services. This write-up will speak about what backlinks are and also the greatest places to get them. Backlink your site and commence seeing the increased traffic from larger search engine rankings. site on my iphone during lunch break. I really like the info you provide here and can’t wait to take a look when I get home. very nice, ensure that is stays up! I’ll go ahead and bookmark your site to return down the road. the articles as long as I provide credit and sources straight back to your site? and my users would really take advantage of several of the information you provide here. Please tell me if this type of okay along. Thanks a lot! really impressed to read everthing at single place. Hi there to every one, it’s genuinely a nice for me to visit this website, it includes helpful Information. I really wanted to provide you with a quick heads up! Hello, yes this article is truly pleasant and I have learned lot of things from it concerning blogging.